dedication: To those Paragons of Patience, Generosity, Long-Suffering Forebearance, Loyalty and Advance Royalty, our Publishers - without whom (or which) assuredly it would never have been written, this Work is gratefully dedicated by The Authors. It can have escaped None but the meanest of Intelligences that, in the World of Entertainment today, the onomatopaeic West Country Name of Mr Acker Bilk has become emblazoned across the Pinnacle of Achievement. With the gentlemanly Members of his jazz Ensemble, he has scaled those glittering Heights whereon dwell the Giant Success, and his Handmaiden, the Lady Fame. Indeed, so high a Place in the publick Esteem do Mr Bilk and his Myrmidons hold, that not only their Performances upon the Concert Platform, but also the very Trivia which make up their private Lives, become a Subject for general Comment and Remark. Less well known - in fact so little known that they are bruited about only in the innermost Circles of Mr Bilk's own close Acquaintance - are the Details of our Hero's peerless Ancestry. Yet, from Ackermemnon to Ackawatha, from King Ackered the Unsteady to John Osbilk, the Ackery Young Man, his splendid Progenitors stride across the Pages of History to proclaim in Letters of Fire his matchless Pedigree. It would seem, therefore, a Matter almost of Publick Duty to place before the Enquiring so much of this deathless Material as may fittingly be recalled, and to complement this, where possible, with Reproductions of the Statues, Paintings, Reliefs, Engravings, Daguerrotypes and even Photographs which commemorate these Men and Women. This, the Authors, to the best of their Ability, have done; Mr Gwynn-Jones with his photographic Apparatus, Mr Leslie with Notebook and Pencil, these Two have journeyed to many distant Lands to garner the Seeds of Knowledge whose Fruits this fascinating Volume reveals. This is one of the more peculiar books I've ever come across. Back in the late-1950s, in the interregnum that separated the first wave of rock & roll and the birth of Beatlemania, a substantial section of British youth found its imagination seized by the trad jazz revival, bringing the likes of Chris Barber, Humphrey Lyttleton and Kenny Ball into public prominence. And perhaps the greatest beneficiary was Mr Acker Bilk, a West Country clarinettist with an image based on his sculpted facial hair, a bowler hat and a waistcoat. 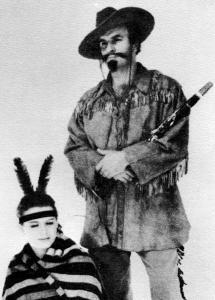 The fact that, shortly after this book was published, Bilk went on to score a massive transatlantic hit with the easy-listening instrumental 'Stranger on the Shore' has distorted his position in music history - he was actually much more roots than that untypical record, very much part of the duffle coat-wearing, CND-marching, mildly alternative strand of British society that greeted the dawn of the Sixties. 'Lay aside your cloaks, O Daughters! 'Lay aside your Mink Bikinis! 'Now, O Sisters! Now Decision! 'Now, for you, it's back to Nature! The best gag in the whole book is John Osbilk, the author of Look Back In Acker and the original Ackery Young Man ('though why he was so ackery, and what he was so ackery about, nobody ever quite discovered'). to mark the 75th birthday of Mr Acker Bilk.